Mong-Lan, writer, former Stegner Fellow at Stanford Univ, Fulbright Scholar, has published seven (7) books of poetry & artwork, three (3) chapbooks, has won prizes such as the Juniper Prize and the Pushcart Prize. Poems have been included in numerous anthologies such as Best American Poetry Anthology and various Norton anthologies. She has finished a novel, with an excerpt in the North American Review. Mong-Lan plays the piano and guitar, sings in six languages, and also composes. Her ten albums of jazz piano and tangos also showcase her poetry. As a visual artist, Mong-Lan has had her paintings and photographs exhibited in museums such as the Dallas Museum of Art and galleries in the U.S., and in public exhibitions in Tokyo, Seoul, Bangkok, Bali and Buenos Aires. Mong-Lan as a dancer has studied ballet, jazz and flamenco, and has specialized as an Argentine tango dancer, performer, and teacher, having over twenty years of tango dance experience, in Buenos Aires, San Francisco, New York City, Tokyo, Bangkok, Hanoi, and elsewhere. Mong-Lan left her native Viet Nam on the last day of the evacuation of Sai Gon. Her new solo show, Ocean of Senses: Dream Songs & Tangos: one woman's journey from Sai Gon to Buenos Aires via America, blends original poetry, jazz piano, guitar, dance, story and song. 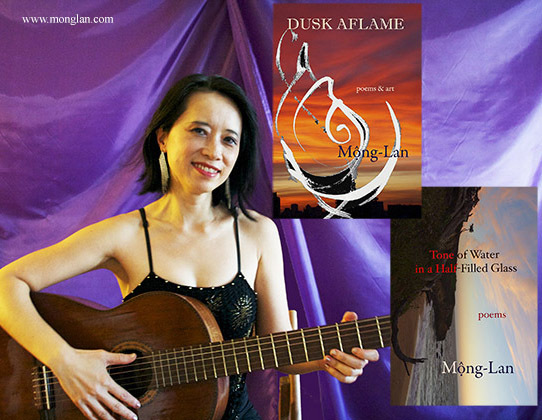 Just released: Mong-Lan's 7th book of poems, Dusk Aflame: poems & art, Jan. 2018, Valiant Press. Just released, new chapbook, Tone of Water in a Half-Filled Glass, May 2018, Foothills Publishing. 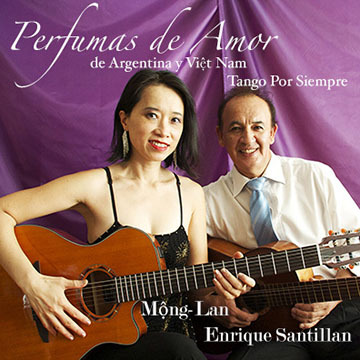 New tango CD release, Perfumas de Amor, de Argentina y Viet Nam, Tango por Siempre, 2018. "The Winding Roads of Poetry & Art" -- blog on Poets & Writer's Magazine on Mong-Lan's recent upstate New York poetic tour, May 2018. Video: "Love Poem to Cafe au Lait," poetry recital with jazz piano, live performance, at La Guagua Poetry Festival, Lowell, MA, 2017. Interview: "Award Winning Poet Mong-Lan's artistic journey from Saigon to Buenos Aires to APAP"--January 2017. "Of Eternity," an excerpt from Mong-Lan's forthcoming novel, is now in the current issue of the North American Review. "Ritual and Improvision," essay on food, published by Inquisitiveeater.com, New School Food, as part of TIE Poet of the Month, June 2016. "Love Poem to Persimmons (Qua Hong)"; "Love Poem to Curry;" "Love Poem to Media Luna," TIE Poet of the Month, June 2016, published by Inquisitiveeater.com, New School Food. Mong-Lan's seventh collection, Dusk Aflame: poems & art, is a bittersweet melange, a delirium of experiences and memories. Buenos Aires looms large with elegiac, nocturnal footsteps: on the edge of chaos and accidents waiting to happen. Where European majesty once molded lives its dying whimper, is resurrected in Latin American brusqueness in a histrionic city towards the end of the world. Buenos Aires, womb and capital of the tango, a melancholic music and sultry dance created by men and women who felt a need for the embrace. Death aspires to be a character here, and Dusk, too, female, animistic. An elegy for all that exists only in memory. On a lighter note, Mong-Lan continues with her cherished theme--love poems to nourishing delectables, like persimmon, rice, and sesame seed. Dusk Aflame includes odes to the body, to the South, New Orleans, Houston, Galveston, and an island off the coast of Thailand. Jazz in poetry, in rhythm to the syncopations of life, to the tango, all comes together in a voice and world vision that is uniquely Mong-Lan's. Mong-Lan's lyrical brush and ink paintings accompany her poems in a poetic dance of movement, providing a visual resonance and portent to her work. Her vital virtuoso strokes assume their own characters and lives of their own. ". 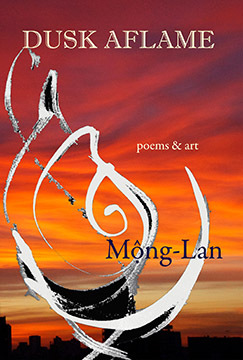 . . A true original, unafraid of sentiment and at the height of her artistic prowess, Mong-Lan’s new book proves she remains one of our leading poets.”—Ravi Shankar, editor of Drunken Boat. 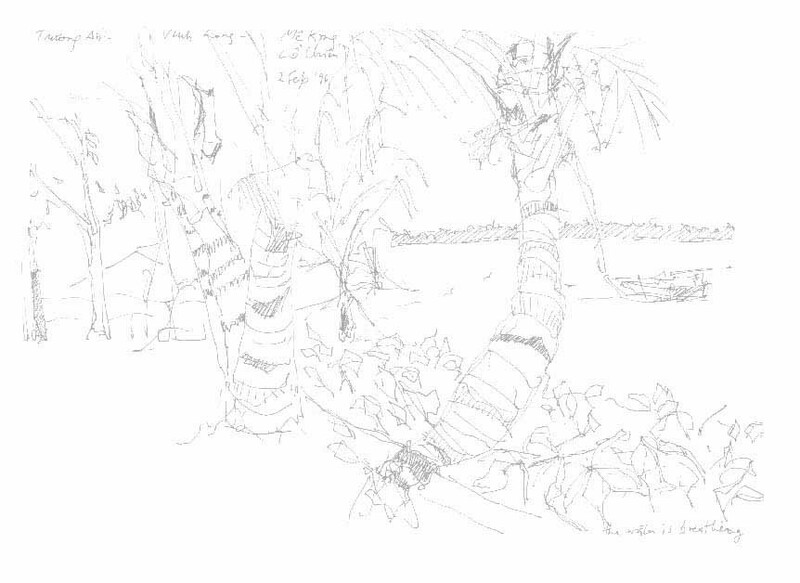 Background drawing of the Mekong river, in Vinh Long, Vietnam, by Mong-Lan, 1996. Website created on May 19, 2001. Last modified November 2018.